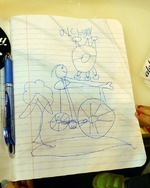 Bicycle ArtistryThis past weekend was the North American Handmade Bicycle Show in Denver, Colorado. I didn’t show bikes this year because I wanted to go as a spectator. For a one person operation the show can be stressful, especially when it’s so far from home that bikes have to be boxed and shipped. It’s also expensive, for travel and hotel, bike transport, and so on. I wanted to avoid all that this time, and see the show from the other side of the table. When I show bikes I don’t have time to connect with many of the other builders, let alone to see what everyone has made Dinucci BB and brought along. It’s a road frame that breaks apart for travel, made by Masa Arai of Silk Cycle. If you’ve seen my work, you probably know that I’m a sucker for a lot of tubes on a bike, double chain stays, extra top tube, etc. Now take a look at this bike. It reminds me of the under side of a bridge with the trusses, everything supporting everything else. The builder is from Saitama, Japan. He’s got some sort of smart-vision to even conceptualize this kind of bike. I don't know how he does it. The way it breaks apart is very clever, and everything is the way it is for a reason. He spent a few minutes showing me photos on his computer of other bicycle creations he’d built. Everything he showed me was unique, inventive, totally original, and just awesome. I’ve really got to go to Japan one of these days and visit some of these guys. They’re so cool. At the Moots booth I talked with Nick for a while about his adventure touring bike. This thing was a monster, ready to go on the long back-country voyages. It’s a very well thought out bike, and it’s clear Nick is ready to use it. And the custom saddle is one of the best I’ve seen. Also to be found in the Moots line-up was a custom titanium chain saw blade protector. Of course. You can’t use a mere machete when bush-whacking in Colorado. It would take you forever to get anywhere. I was pleased to see Aaron Stinner of Stinner Frameworks showing his wares. Of course I didn’t get a decent photo, but you ought to check out his website. He was a student of mine at UBI a while back, and it looks like he’s doing some good work. Another of my favorite bikes at the show was this mountain bike made by Curtis Inglis of Retrotec and Inglis Bikes. This bike won the award for Best Mountain Bike, and was built for Darren, who I see at just about every show. Lucky guy. If you’ve been paying any attention, you’ve probably heard that fat tire bikes (aka ‘fat bikes’ or ‘snow bikes’) have become extremely popular over the past year or so. There were a lot of them at the show this time. One of my favorites of this category was made by Rick Hunter of Hunter Cycles. It’s a fat tire long tail that he made for Scott of Porcelain Rocket. Coincidentally, Porcelain Rocket is a custom bag maker, so Scott fabricated the frame bag and some oversized panniers for his bike. He does some good work. Scott is taking this monster bike to Australia to hit the back country for a four or five week tour coming up in the next few months. It looks like the right machine for the job. This by Boo Bicycles is really attractive for its lines and simplicity, and its mixture of materials. I’m curious to know how it rides. I believe this won an award, but I don’t remember what for. Mixed media, maybe. I think this bike is absolutely gorgeous. It was made by Chris Bishop of Bishop Bikes. It won the award for Best Road Bike, and I didn’t see it until after it was given the award. Consequently, I couldn’t get any good photos because of all the people hovering around. But check out the bi-laminate lugging on the head tube. So clean and simple and perfectly executed. Very nice. Here’s some artwork I had the pleasure of seeing made at the Alchemy booth. I didn’t get the artist’s name or age, but you have to agree that he’s good. What would any of us do if there weren’t a bike in the Bilenky booth painted a Wonder Woman theme? Steven Bilenky is one of my favorite builders. Ira Ryan and Tony Pereira launched their new bike brand, Breadwinner Cycles. Their bikes looked good, and I wish them all the best in their new venture. If you want to know more about Breadwinner, check out the article on bikeportland.org. Another one of my favorite builders of all time is the legendary Steve Potts. This is a mountain bike he built way back in the early days, like 1983 or 4. He’s such a nice guy, and I love that he’s a builder who can genuinely say, “Oh yes, I built the frame, fork, and stem; I made the hubs and bottom bracket and fabricated the roller-cam brakes in my shop. I made the shifter mounts and designed the handlebar and the saddle, too. Oh, and the cranks.” And the tires, and so on. I wish I was that smart, and that motivated. These last photos are of the unofficial show that went on for a few hours Saturday evening. This was at a separate venue, with some of the old-time builders there, as well as Boulder Bicycles, and Wayne Bingham showing a selection of Var tools. There were about 15 or 20 old bikes on display, showing a cross section of several years of hand made bicycle craft. Most of the bikes were made by Rene Herse. I think my favorite of these was the tandem. Here, Mark Dinucci shows one unpainted bike. Everything about it is immaculate, simple, and just perfect. Mark’s awesome. Mark Nobilette had his personal bike there. Every detail was just right. I’m embarrassed to say that the photos I took of Bruce Gordon’s ‘gravel grinder’ came out so terribly that I have nothing to post. But, if you’re familiar with Bruce’s work, you know it was good. And I dig his new tires. I hope you enjoyed all this. I had a conversation with Richard Sachs about bicycle business that got me to thinking about things. Maybe I'll put some thought to it in the coming days.